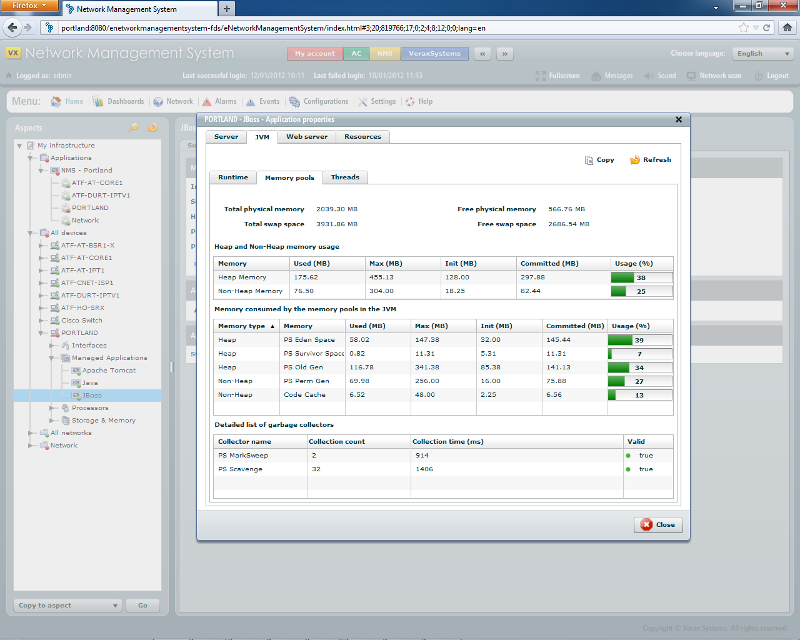 JBoss management plugin enables easy monitoring, alerting, health check, management and performance reporting for JBoss servers. The plugin supports JBoss versions 5, 6, 7 and higher over the Java RMI (Remote Method Invocation) protocol. Server version and build details: date, platform, operating system and JVM (Java Virtual Machine) used for build. Host and runtime environment: operating system and architecture, Java vendor and version. Runtime statistics: status, maximum memory permitted for the server, memory still available, number of threads running. List of server parameters and their current values such as HomeDir, ServerName and others. Process name and PID for the JVM. JVM identification string (e.g. Java HotSpot Server 19 VM). Start time and startup options: command line arguments, boot class paths and library paths. Heap and non heap memory usage. Memory consumed by individual memory pools. Detailed list of garbage collectors with name, number of collected objects, collection time and collector status (valid or invalid). Thread statistics: current number, peak number, total number of threads started since server startup, number of classes loaded/unloaded. Detailed list of all threads with their name, state (runnable, blocked, waiting, etc. ), block and wait counts, CPU time and deadlock status. General information: status, web server name, address, port, base directory and others. Connectors configured for the web server (name, address, port, protocol) along with the detailed statistics for each connector: number of threads, bytes sent/ received, processing time and number of requests serviced. Applications deployed on the server: name, start time, startup time, URL and detailed statistics for each application: hitCount, accessCount, cacheSize and others. Servlets running on the server: name, total processing time, maximum single processing time, load time, number of requests, number of errors. Worker summary with information about request bytes sent, total processing time, maximum time for a single request, maximum request URI, currently processed URI, current query and thread name associated with the worker. Provides a summary of resource adapters, databases and queues within the application server. The plugin provides predefined templates for most commonly monitored JBoss items (listed in the table below). Other, user-defined sensors and performance counters can be added. Verax NMS & APM JBoss management plugin allows opening of server’s JMX console, administrator console and online documentation directly from the NMS.